I am not a real crafty mom in general. 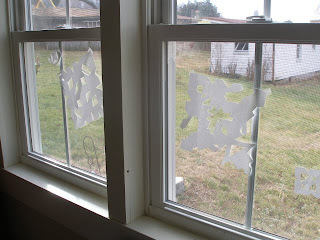 When it comes to Christmas time, though, making paper snowflakes is irresistible to me. Sam and Sadie are really enjoying making these this year. I still think I enjoy it more. Here are two Sam made and the one bottom left is Miss. Sadie's. She just makes little snips around the edge. Very pretty, no? Sam tried a new Christmas craft this year. It's something I never would have thought of and maybe your kids would like to try. First, you stand on a chair to reach the craft cabinet key that you are not allowed to use without permission. Remove from the cabinet some gold glitter glue. Squeeze some of the glue out onto the carpet in a place your mom won't notice for a good while. Then, go to the fridge and get an egg. Yep, a raw egg. Place the egg in the glitter glue and let dry. Doesn't that sound lovely? The egg doesn't break until it is removed from the glue by the parent. A Christmas craft booby trap of sorts. Reactions from the parents and punishments may vary. Be creative! Since when are you "not a real crafty mom in general?" If you have a locked craft cabinet, then you are by definition a crafty mom - and we love you for it! Oh, that is funny, Sam. Very, very funny. I'm going to wait to read this post to Mr. H until my kids are out of the room---don't want to give them any ideas. Oh my word! That was hillarious! 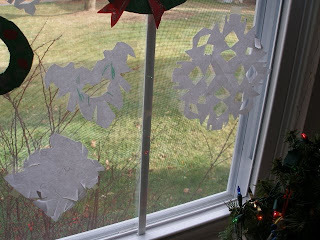 However, I don't believe I am "crafty" enough to let my kids try that one! That sounds like a story Sam will be telling his grandkids someday!